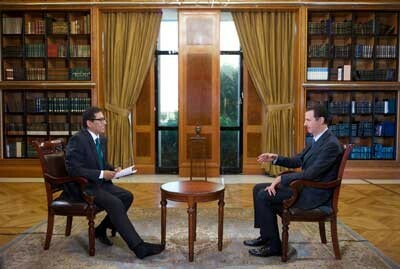 Damascus, SANA _ President Bashar al-Assad gave an interview to Latin America TeleSUR TV channel. TeleSUR: Welcome TeleSUR viewers to this special program covering the events in Syria. Our distinguished guest has managed to capture the attention of the whole world – President Bashar al-Assad. Mr. President, thank you for giving this interview to TeleSUR, which we hope will provide an opportunity for our viewers in Latin America to understand your perspective and your views. Welcome to the program. President Assad: I would like to welcome you and TeleSUR in Syria and to extend my good wishes to you on your recovery from your leg injury. I believe that my interview with a journalist who has witnessed terrorism first hand will be pragmatic and rich. Once again, I welcome you as a journalist whose blood has been mixed with the blood of soldiers from the Syrian Arab Army. TeleSUR: Thank you. Indeed, there are many common factors between us, including this blood. You mentioned terrorism – a car bomb exploded in Damascus yesterday, killing and injuring many civilians. What is the terrorist’s message particularly in these circumstances facing Syria and the world? And how do you see the current efforts to confront terrorism in Syria? President Assad: These terrorists have only one message, which is the dark ideology they carry in their minds; for them, all those who do not think like them do not deserve to live. Every so often, they carry out these acts of terror to either attract people to their cause or to frustrate them. In other words, they want people to lose hope – and when you lose hope, life has no meaning. So in one way or another you become closer to them. From another perspective, these terrorist operations are financed, planned and instigated by people outside Syria with the aim of pushing Syrians towards complete despair, making them believe that there is no hope in their homeland and that the Syria which has existed for centuries no longer exists. Loss of hope pushes people towards defeat, which in turn makes them stop defending their country. What you saw yesterday was only one of hundreds of attempts in that direction; in fact they have all had the opposite effect – Syrians today are more committed than ever before to defending their country. TeleSUR: Mr. President, yesterday we heard US President Barack Obama speech reflecting on what the United States has done in different parts of the world, he spoke specifically about the situation in Syria; Syria was also a major issue at the United Nations. President Obama, more or less agreed on the need for a political solution in Syria, however, he called on the United Nations or the Security Council to pass a tough resolution against Syria and against your government if you do not continue to fulfill requirements of the chemical weapons agreement. He also stressed that, as far as the United States is concerned, your government was responsible for the chemical weapons attack against civilians. President Assad: His speech yesterday was more of the same – full of allegations based on fabrications and lies. In general, most statements made by American officials, whether in the current or previous administrations, do not have the least bit of credibility. Their statements are often similar and repetitive, and as such we do not feel it is necessary to comment. Since the beginning of the Syrian crisis, American policy, whether knowingly or unknowingly, has been based on lies. I believe that they were aware of most of these lies, which increased in intensity, and the administration played a direct role in these fabrications after the chemical weapons issue was raised on August 21st. The administration has not provided any evidence to support its claims, which implies that it was lying to the American people. From the beginning, we challenged them to present their evidence, which they didn’t; when they failed to convince the American people of their allegations, they couldn’t retreat and so became more determined. As for their talk about invoking Chapter Seven, this does not concern us in Syria. First since independence, it is well known that Syria has always committed to all agreements it signs. Second, today there is balance in the Security Council which prevents the United States – as was the case in the past, from using the Security Council as an instrument to achieve its special agendas, including toppling regimes and destroying states as was the case in 1990s. As I said, these American allegations are nonsense and have no realistic or logical foundation. TeleSUR: Back to President Obama’s speech, we saw that he was confused and didn’t know what he wanted. Sometimes he speaks about the use of force and sometimes he speaks about a political solution. He says that the Israeli aggression against Syria is in defense of American interests in the region. What are America’s interests in the region, and what is it looking for in Syria? Taking into account what’s happening at the Security Council concerning Syria, are you able to rule out an American aggression against Syria? President Assad: With regards to the contradiction you mentioned, this has become the hallmark of every statement made by every American official, be it the President, his Secretary of State or others. For instance, they say that Syria’s military capabilities do not pose any concern to the American army should it decide to carry out any military action or aggression against Syria; however, at the same time, they say that Syria is a threat to American national security. This is just one of many examples in this regard. As for the possibility of an American aggression, if you look back at the wars waged by the United States and American policies – at least since the early 1950s, you find that it has always been a policy of one aggression after another – starting with Korea, then Vietnam, Lebanon, Somalia, Afghanistan and Iraq; this is the American policy. We also cannot forget American policy in South America where it instigated military coups and caused the deaths of millions; tens of governments were toppled as a result of American policy. For decades this has been their policy, which continues today – unchanged, it is also unlikely to change in light of the current American domestic situation. So the possibility of aggression is always there, this time the pretext is chemical weapons, next time it will be something else. The more important element in all of this is that for decades, the United States has been superseding the Security Council, superseding the UN Charter, superseding the sovereignty of states and superseding all human and moral conventions. So, maybe all of us in the world need to keep this possibility in our minds – and this what we are doing in Syria. Is there a possibility of aggression? It might not be now, but nobody knows when it could happen. It remains a possibility, and we shouldn’t rule it out. As for the interests of the United States, I believe that for decades, the actions of the United States, through wars and interventions, completely contradict their interests. It is a superpower and as such has political, economic, military and other interests. It can achieve these interests through mutual respect, good relations, trust, credibility and promoting science and knowledge instead of spreading terrorism, destruction and fear. There’s no doubt that as a superpower it has interests. Most of the big powers have interests around the world, but these interests need to be based on achieving stability in the world first. You cannot have any interests in an unstable region full of wars and terrorism. So yes, it has interests, but everything the United States is doing and all its policies, contradict its interests and the interests of the American people. TeleSUR: As Your Excellency said, the speech of the American President is in line with this great degree of contradiction, which characterizes the American empire. Yesterday he talked about a political and peaceful solution for the Syrian crisis; nevertheless he left the door open for you to step down. He literally said that the time has come for Russia and Iran to know that President Assad remaining in power means giving extremist groups a wider space to step up their activities. What do you think of what Obama said, and do you consider it likely that you will step down? President Assad: As for your first point, this is another example of American contradictions; it’s like saying that we are seeking war and peace on the same issue and we are using the same roadmap to resolve the matter. This logic means promoting violence in the world and legitimizing violence as a means to reach a political solution. This is illogical. There is nothing in common between violence and political action. Violence destroys any chance for political action. We reject this logic, which the United States has recently tried to promote in order to justify aggression on Syria. As to the question of stepping down, American officials – or some of their European allies, have been raising this issue for over a year. It doesn’t concern us for a simple reason: Syria has been independent for generations – for more than five decades, the United States has not toppled a president in Syria and has not brought any official to a position of power. So the United States cannot presume now that it has the right to decide, on behalf of the Syrian people who is in power and who isn’t. This issue is decided upon one hundred percent by the wishes of the Syrian people; even friendly countries have no say in this matter. This is determined by the desires of the Syrian people, which are solely expressed through the ballot box. When the Syrian people don’t want you, you should leave immediately; and the opposite is true. Regardless of what the United States says or does in this regard, it has no role whatsoever. That’s why these statements are of no significance to us. TeleSUR: Let’s finish this discussion about Obama with what he said: “the world is better now thanks to the United States.” How do you think that the world is better thanks to the United States? President Assad: Let’s talk about facts. Has Iraq become better with the American presence? Has Afghanistan become better? Is the situation in Libya better? Is the situation in Tunisia better? Is the situation in Syria better? In which country is the situation better? Was Vietnam better when the Americans interfered or when it was left alone to become independent and develop on its own? Look at the situation in South America: is it better now or when the United States used to interfere? The truth is that the world is better when the United States stops interfering – we don’t want it to help anyone. He (Obama) said yesterday “we cannot solve the problems of the whole world” – well, I say that it is better if the United States does not solve the problems of the world. In every place it tried to do something, the situation went from bad to worse. What we want from the United States is for it not to interfere in the affairs of other countries, then, the world will certainly be better. However, if he meant that the spread of terrorism everywhere is better, this confirms what some Americans are saying in the American media – that the Obama policy is based on supporting extremism and terrorism. If this is the case, then what he said in this regard was accurate – that the world is better because of the spread of terrorism throughout the world. TeleSUR: Did you found anything new in Obama’s position towards President Rohani when he quoted President Rohani as saying that there is no military solution to the Syrian crisis, and that the chemical weapons were passed to the armed groups fighting in Syria by Western countries? And how do you see President Rohani’s position when he calls for the cessation of financing and arming of the opposition? President Assad: The Iranian position towards the Syrian crisis is very objective because they know the reality of what is happening in Syria. At the same time, they understand that this is one region, and consequently if there is a fire in Syria, it is bound to spread to neighboring countries and later to countries further away, including Iran. Iran bases its policies on these foundations and also on the grounds that it is the Syrian people’s right to solve their own problems. As to American remarks on the Iranian position: first, as I said before, regardless of whether American statements are positive or negative, whether they praise, criticize, condemn or denounce – nobody believes them. In the same token, the Iranians are not naive to be deceived by the American position; Iran’s experience is similar to Syria’s experience with successive American administrations, at least since the Islamic Revolution in Iran. That’s why what concerns us is not the American remarks, what is important for us is the essence of Iranian policy towards Syria; and once again I stress that in essence it is objective and achieves stability for our region, if different parties in Syria have adopted the Iranian vision. TeleSUR: In fact, in Iranian statements at the United Nations, there was a proposal about Iran’s relations with the United States to the effect that a meeting will be held between the Iranian president and the American administration. Such meetings have not taken place for a long time. How do you see the rapprochement? Is the United States really engaging Iran, or is it just an attempt to push Syria’s friends away from it? Or is this position another way of saying that the United States has no choice but negotiations rather than the use of force to protect its interests? President Assad: First, unfortunately even the United States’ closest allies do not trust them; so the Iranian-American rapprochement does not mean that Iran trusts the United States. Our relations with the United States have been through various stages of ups and downs, but trust has never existed at any of these stages. However, in politics, you need to try all methods and means and to knock on all doors in order to reduce tension in the world. So, communication and dialogue are necessary in relations between states. We believe that the rapprochement between Iran and the United States, whether regarding the Iranian nuclear program or regarding anything else, is positive and good for the region, if the United States has a real and genuine desire to deal with mutual respect with Iran, not to interfere in its domestic affairs, and not to prevent it from acquiring nuclear technology. On the other hand, I can’t imagine that the United States has abandoned its principle of resorting to military force. I think the opposite is true; when the United States saw that it had competitors on the international arena – or let’s say partners, if not competitors, in the form of great and emerging powers in the world, – it started to resort more to the principle of force, although this same administration was elected on the basis of rejecting the Bush doctrine of using force; now, it returns to the same doctrine. I believe that they are trying to co-opt the Iranian position as they tried to do with Syria a few years ago, but the Iranians are fully aware of this game. TeleSUR: Mr. President, going back to Syria and the chemical weapons issue. What are the real guarantees provided by your government that the list you submitted on your chemical arsenal is truly representative of the weapons you possess? And what are the guarantees you provide to the UN investigators in order that they do their job, inspect the sites and put the chemical weapons under international control? President Assad: Our relationship on this issue will be with the Organisation for the Prohibition of Chemical Weapons (OPCW). Syria is not required to provide guarantees to the world or to the organization, it is required to deal with specific mechanisms or to abide by specific mechanisms stipulated in the chemical weapons convention. And as I said before, Syria is committed to all agreements it signs. Syria has recently sent the required data to the OPCW. Shortly, OPCW’s experts will visit Syria to familiarize themselves with the status of these weapons. As a government, we do not have any serious obstacles. However, there is always the possibility that the terrorists will obstruct the work of the investigators in order to prevent them from reaching the identified sites, either because they have their own motives or because they are acting on instructions from the states that support and finance them. Either way, we expect that their objective is to blame the Syrian government for not cooperating with the investigators. But as far as we are concerned as a government, we have no problem with agreeing to the mechanisms provided by in this agreement. TeleSUR: The international investigators will return to Damascus today to identify other places where there were allegations that chemical weapons were used, in addition to the August 21st incident. What are your government’s guarantees that the investigators will do their job freely and independently? President Assad: This group hasn’t come to Syria on the initiative of the United Nations or any other country. It was the Syrian government who invited the investigators to come to Syria last March, when the terrorists used toxic gases in an Aleppo suburb in the north. In fact, it was the United States that created obstacles in order to prevent them from coming. We invited them, since we have an interest in their visit in order to determine the truth about the use of chemical agents in Syria. So, it is illogical for us to invite them and create obstacles to prevent them from doing their work. Even when the mission left Syria a few weeks ago, we had wanted them to complete their visits to the areas where chemical weapons had allegedly been used; it was the United States that insisted on them leaving before they had completed their mission. Now that they have returned, the Syrian government certainly supports their mission. And as I already mentioned, there are no obstacles except when the terrorists obstruct the work of the mission, particularly in the places where terrorists exist in large numbers. TeleSUR: Despite the allegations that it was the Syrian government who used chemical weapons, the Russian government provided the United Nations with evidence that it was the armed groups who used the chemical weapons. What evidence do you have? And what is the Russian and Syrian government doing in order to prove that it was the terrorist groups and not the Syrian government who used chemical weapons? President Assad: Of course we have both evidence and indicators. As for the evidence, when toxic gasses were used in Khan al-Assal, we took samples from the soil, blood samples from the victims, and also pieces from the projectiles used to carry the toxic material to that region. Later on, during operations carried out by the Syrian Army, a number of hiding places were discovered housing different sized containers filled with chemical agents – and in some cases toxic materials, as well as the instruments required to manufacture them. We provided the evidence to the Russian government before the UN mission came to Syria. We also have the confessions of the terrorists who brought some chemical agents from neighboring countries into Syria. These confessions were broadcast on television about a week ago. Why the Syrian government did not use these materials?. First, the Syrian forces were making progress: they did not use them a year ago, when the terrorists were much stronger, so why should they use them now? The Syrian forces did not use them in remote areas where there are a much larger number of terrorists than in Damascus suburbs, so why should they use them here? You can’t use these materials in residential areas where they likely to kill tens of thousands and not only several hundreds or a thousand. You cannot use them in places close to your own forces – Syrian soldiers, because the soldiers themselves will be killed. So, logically, practically, militarily, they can’t be used in such conditions. In any case, when you have a crime, one of the first questions a detective asks is who has an interest in using these weapons, or who has an interest in this crime. It is very clear that the terrorists have an interest in this crime, particularly when these allegations coincide with the investigating team’s mission to Syria. Can you really believe that the Syrian government invites an investigation mission, only to use chemical weapons so that the mission can investigate their use? This is unbelievable, totally illogical. All the indicators show that the Syrian government did not use them, and all tangible evidence shows that it was the terrorists who used the chemical weapons near Damascus. TeleSUR: In this context, what was the role of Saudi Arabia and Qatar in bringing these chemical weapons to the armed groups? President Assad: To be precise, we have no evidence that they passed chemical weapons to these groups. But it is well-known that these countries have been supporting the terrorists since the beginning of the crisis in Syria. They have, without exception, provided them with all kinds of sophisticated weapons; this is certain and well-documented. So, it is to be expected – that when these countries openly and publically support these groups and provide them with all kinds of weaponry, it is to be expected – that they are accused, especially Saudi Arabia, of delivering these types of materials to the terrorists to be used against the Syrian Army. This is all the more so, since these terrorist groups have failed to present to their masters outside Syria with any real achievements militarily on the ground. Of course, they have been able to destroy a lot in Syria; they have destroyed the infrastructure, they have affected the economy, and they have affected the life of civilians in a very negative way. We have no doubt that these terrorist groups have caused a great deal of suffering, but I’m referring here to military achievement in line with the objectives that were given to them. In this regard, they failed miserably, so they had to resort to a different kind of weapon. By using these weapons, they would either defeat the Syrian Army or apply political pressure to reach an agreement on foreign intervention so that the United States and its allies can launch an aggression against Syria and weaken the Syrian Army. Of course, the second option is the more likely scenario. TeleSUR: There is a chessboard under the table. It’s known that there are agreements done under the table, and someone is moving the pieces under the table, and that someone is Israel. Israel has a role in what is happening in Syria. Why are they talking about chemical weapons in Syria and nuclear weapons in Iran while not talking about the Israeli nuclear weapons? President Assad: Israel is an aggressive state. It was created based on expansion. It occupies other people’s land and kills the people surrounding it. It has killed numerous Palestinians for over six decades. It killed numerous Lebanese and many Egyptians, Syrians and others using assassinations, bombing, terrorism and other methods. Today it plays the same role by supporting the terrorists directly in the areas adjacent to the Syrian front, i.e. near the occupied Golan, where it provides them with logistic and medical support and also with information, weapons and ammunition. TeleSUR: There are also reports that Israel has oil interests in some Syrian regions? President Assad: This has been reported, particularly concerning oil on the Eastern Mediterranean coast, but these are mere analysis and we have no concrete information. As for Israeli nuclear weapons, as you said, nobody talks about them because Israel, the aggressive state, the rogue state, enjoys full support from the United States in all its policies. It covers up all its crimes. As long as this process of covering up continues inside the United States, in the Security Council and the United Nations, in the international organizations, including the IAEA, it’s no longer surprising that any weapon anywhere in the world can be discussed, but not Israeli weapons. This is the prevailing logic in the world, the logic of hegemony, of colonialism, the logic of force. TeleSUR: Mr. President, while they are trying to reach a political solution for the crisis at an international level, what are you doing inside Syria in order to reduce the tension? Are there any attempts to engage the different parties in Syria? Is there any hope of an internal solution in Syria leading to the Geneva conference? President Assad: No matter how intense the terrorist operations become, and how bad the situation is, we should continue to initiate political action to solve any problem. We believe in this and have pursued it from the very beginning, despite the recent escalation of terrorist acts. Political action requires, first of all, putting an end to smuggling terrorists from neighboring countries and stopping the support for these terrorists with weapons, money, and all the logistical support necessary to help them carry out their terrorist operations. At the same time, dialogue is inevitable among Syrians, all Syrian parties about the future of Syria. This dialogue should start with the political system in the country: which system do the Syrians want, and consequently address the laws and regulations that stem from that system. There are many other elements and details: when the Syrians at the table reach a certain conclusion, it should be presented to the Syrian people for approval through a popular referendum. Now, the Geneva conference is an important venue, and it provides an opportunity for dialogue among the different Syrian constituents. Of course, we do not assume that the terrorists who carried out acts of killing will attend, neither do we accept that dialogue can be conducted with entities which called for foreign intervention. By law, and judging by the popular sentiment in Syria, those who called for foreign intervention are traitors and cannot be accepted by anyone. As for the principle of the Geneva conference, it is an important and necessary step towards paving the way for dialogue between Syrian constituents. But the Geneva conference cannot replace internal Syrian dialogue, and certainly it does not replace the opinion of the people, which should be determined through a referendum. These are the broad lines of our vision for political action to solve the Syrian crisis; all these elements will not achieve any real results on the ground if support for terrorism is not stopped. TeleSUR: You stressed that you’ll not negotiate with the armed groups and the terrorists in Geneva. Who are the parties with whom you will negotiate? How can this dialogue be achieved on the international level, and what is the timeframe for achieving a political solution for the Syrian crisis? President Assad: I can answer the part of the question that is related to the parties inside Syria, which represent the Syrian people. There are different types of parties – opposition parties, parties in the middle, or parties supporting the state. With regards to the parties outside Syria, we need to ask the states that support them because these states, – the United States, France, the United Kingdom, Saudi Arabia, Qatar, and others – have propped up these individuals who do not represent the Syrian people. If these states tell them to go to Geneva, they will go; they will say and do as they are told. If we want to have an answer to this part of the question, we need to ask those states whether they intend to send these individuals or not, because they do not represent the Syrian people, neither the Syrian people nor the Syrian government will be sending them. This is why I have said that by dialogue, I mean engaging with the various opposition groups, basically, based in Syria as well as other influencers and movements that do not necessarily belong to the opposition. TeleSUR: I cannot finish this interview without mentioning the leader Hugo Chavez who visited Syria and went with you to Maaloula, which only a few days ago suffered an attack carried out by extremists. When he was in Maaloula, President Chavez said “Nothing human or humanitarian can be used to justify an attack and an aggression against Syria. How can we not support the Syrian government? How can we not support the government of President Bashar al-Assad?” How can they support armed groups?” Could you please give us your impressions and your recollections of President Chavez’s visit to Syria? And what do you think of the position of Venezuela and the ALBA countries in defending freedom and defending Syria and the rights of the Syrian people? President Assad: We have always said that the developing world, of which we are both a part of, has been through a number of stages in its pursuit of independence. The first stage was with the evacuation of foreign forces from our occupied countries, which most countries have been able to achieve through their independence. The second stage, which is more important, is the independence of political, economic and military decisions – the independence of national decision-making so to speak. This was achieved in Latin and Central America in the past two decades. There were two symbols for this independence: President Castro – five decades ago, and President Chavez. When we remember President Chavez, we remember this second stage because the endeavors we are facing in our region, in the Middle East, are similar to those that you went through earlier in Latin America. When you achieved independent national decision-making, the situation in South America, and even Central America, became much better and political stability started to yield economic benefits. When you started economic development, some countries emerged as industrial powers and have become important economic powers. This is the natural outcome of independence. To date in the Arab region, we have barely achieved minimum independent political decision-making and in a limited number of countries. The conflict with the West now is in part related to this point, in other words, gaining independent national decision-making. I believe that South America in general, Venezuela and President Chavez, and before him President Castro, are important role models to be followed on the road towards independence and freedom sought by nations trying to shrug off Western hegemony in the form of long decades of direct colonization and, today, indirect colonization. There are many similarities in temperament, in emotions and in the warmth felt by citizens of the same nation in your country and in ours. There are also similarities in our histories. President Chavez and President Castro aside, there are many presidents in Latin America today walking the same line of President Chavez. But, I would also like to especially mention my friend and brother President Maduro whom I know through a number of meetings, during my visit to Venezuela and his visits to Syria. We are very happy that the Venezuelan people decided to choose this person to represent and enforce the political line taken by the President Chavez. He is a resilient and proud leader who has a clear understanding of our region; I am sure that he will continue to lead Venezuela to the path of independence. We all know that the United States and some of its allies had great hopes that Venezuela will return to America’s embrace in the absence of President Chavez. With President Maduro at the helm, these dreams have evaporated. I believe that as Arab states, we should follow the path of Latin America if we want to make a mark in the world, to be independent and advanced. TeleSUR: Thank you very much, Mr. President for everything you have said, give us one last message to Latin America: will Syria remain steadfast? Will she triumph? President Assad: Had we had other choices but to stand fast, I would have shared them with you, but we have no other choice but to stand fast because the political future of this region is tied to what is happening in Syria. We are not only defending Syria, or just our interests and principles, we are defending the future of our children and the future of the whole region – and this region is the heart of the world. An unstable Middle East undermines the stability of the world, even remote parts of the world. We cannot refer today far away regions like Latin America, North America or East Asia; the world today is a small village, and what’s happening in Syria will affect the surrounding region. What happens in this region will affect the remotest part of the world. I don’t want to say that we want the peoples of Latin America to support our causes, because they always support Arab causes with no less warmth and objectivity than our own people who live in this region and belong to these causes. We hope to enhance this relationship between us in order to enlarge the space of independence and reduce the space of colonization represented by the West and the United States in particular. TeleSUR: Thank you very much, Mr. President. This was a special interview with His Excellency President Bashar al-Assad. Thank you to our friends in TeleSUR and in Latin America for staying with us. Be sure that our objective at TeleSUR is to bring people together.